Meningitis is an inflammation of the covering of the brain and spinal cord. It can be caused by viruses, parasites, fungi, and bacteria. Viral meningitis is most common and most people recover fully. Parasitic and fungal meningitis are very rare. Bacterial meningitis is very serious and may involve complicated medical, surgical, pharmaceutical, and life support management. Someone with meningitis will become very ill. The illness may develop over one or two days, but it can also rapidly progress in a matter of hours. Not everyone with meningitis will have the same symptoms. Children (over 2 years old) and adults with meningitis commonly have a severe headache, high fever, and neck stiffness. Other symptoms might include nausea, vomiting, discomfort looking into bright lights, confusion, and sleepiness. In both children and adults, there may be a rash of tiny, red-purple spots. These can occur anywhere on the body. The diagnosis of bacterial meningitis is based on a combination of symptoms and laboratory results. If it is diagnosed early and treated promptly, the majority of people make a complete recovery. In some cases it can be fatal or a person may be left with a permanent disability. 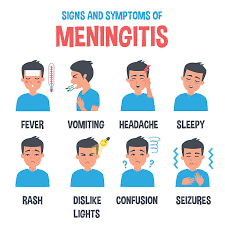 Fortunately, none of the bacteria that cause meningitis are as contagious as diseases like the common cold or the flu, and they are not spread by casual contact or by simply breathing the air where a person with meningitis has been. They are spread when people exchange respiratory or throat secretions (such as by kissing, coughing, or sneezing). The germ does not cause meningitis in most people. Instead, most people become carriers of the germ for days, weeks, or even months. The bacteria rarely overcome the body’s immune system and cause meningitis or another serious illness. Maintaining healthy habits, like getting plenty of rest, can help prevent infection. Using good health practices such as covering your mouth and nose when coughing and sneezing and washing your hands frequently with soap and water can also help stop the spread of the bacteria. It’s a good idea not to share food, drinks, utensils, toothbrushes, or cigarettes. Limit the number of persons you kiss. There are vaccines available to offer protection from some of the bacteria that can cause bacterial meningitis. * The vaccines are safe and effective (85–90 percent). They can cause mild side effects, such as redness and pain at the injection site lasting up to two days. Immunity develops within seven to ten days after the vaccine is given and lasts for up to five years. You should seek prompt medical attention. Your school nurse, family doctor, and the staff at your local or regional health department office are excellent sources for information on all communicable diseases. You may also call your local health department or Regional Department of State Health Services office to ask about a meningococcal vaccine. Additional information may also be found at the Web sites for the Centers for Disease Control and Prevention, particularly the CDC’s information on bacterial meningitis, and the Department of State Health Services. NOTE: DSHS requires at least one meningococcal vaccination on or after the student’s 11th birthday, unless the student received the vaccine at age 10. Also note that entering college students must show, with limited exception, evidence of receiving a bacterial meningitis vaccination within the five-year period prior to enrolling in and taking courses at an institution of higher education. Please see the school nurse for more information, as this may affect a student who wishes to enroll in a dual credit course taken off campus.